Converting your loft into a room can add valuable space to your home, and can add financial value to it if at some point you wish to move on. With your children getting older they will want more space, and a three bedroom house will sell for more money than a two bedroom house. This page will look at the things to consider in designing and building a loft conversion in Peterborough at your home. Due to space constraints you may not be able to turn every loft space into a bedroom unless you extend the building in some way. There are building regulations governing a number of factors that will dictate whether the new space can be considered a bedroom. These include the size of stairwell that needs to be put in place, as well as ventilation, the strength of the floor and proper sound and heat insulation amongst other things. You do not always need planning permission to build a loft conversion, depending on the volume of the space you wish to convert. Staying within the constraints while possibly reducing the space you have can save you a lot of time and money in planning and preparing the attic conversion. We will discuss these factors and others below. After considering the regulations involved, and deciding how much space you really want to add to your home, you need to get an architect to help design the new space that will need to be in keeping with the surrounding architecture. They will state what needs to be done and what trade people need to come in at what stage. Our bricklayers will come in very early on in the process, while the electrician and any plumbers will come onto the job much later in the process for example. Where you need to do structural work to your home for the loft conversion, come to us for a quote! Our bricklayers can come to your home within 50 miles of Peterborough. The areas of Peterborough (PE1) we cover are: Bretton (PE3), Orton (PE2), Deeping (PE6), Bourne (PE10), Stamford (PE9), Spalding (PE12), St Neots (PE19), Huntingdon (PE28), Oakham (LE15), Uppingham (LE15). Loft conversions are a great way to make the most of natural light. 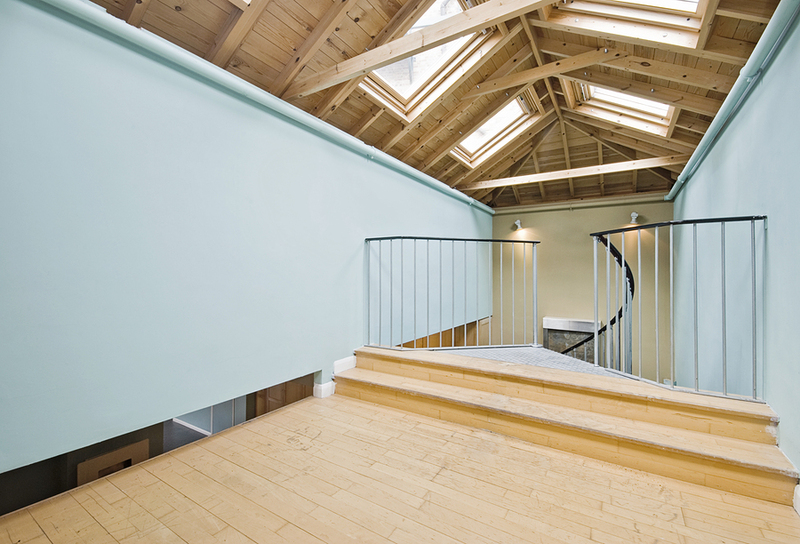 Why have an attic conversion? There are two reasons that homeowners consider having a loft conversion. The first is that they need more space for their family, yet are very happy with where they live and don’t want to move house. Loft extensions are seen as a cheaper alternative to ground floor or two storey house extensions, but they aren’t a case of putting a few floorboards in the attic and fixing a ladder through the hole to the loft! There are a number of building regulations around the space in order to make it safe and warm. Another reason for converting a loft is that you wish to add value to your home for sale. Loft conversions can add 20% to the value of your home, which could be a considerable sum depending on where you live. Here you have to be very careful that you spend a lot less on the conversion than the added value to your home or the investment won’t be worth your while. Have you enough space to put in a proper stairwell? This will dictate whether the attic conversion meets fire and building regulations. How large is the space in the attic? If you need to extend the attic itself you may need planning permission. What rooms do you want in the space? Some people have an en suite bathroom as well as a bedroom – others may want two bedrooms, or just a playroom / office space. Where will you put the water tank? Is the chimney in good condition and to one side of the space? There needs to be a minimum of 2 metres of headroom at the top of the stairs. This is measured from the height of the new floor to the new ceiling that will be put in. Is your roof traditionally pitched or hipped with differing pitches? Traditionally pitched roofs are easier to convert inside. If a second floor extension, the stairs need to be protected and have immediate access to two routes of escape. If the rafters are trussed, you need advice from a qualified building engineer. Most houses built after the 1960’s have trusses! If your existing roof pitch is less than 30 degrees and the roof span is less than six metres then this may not be suitable for a loft conversion as there won’t be enough liveable volume there. There are government guidelines that dictate what can be counted as a bedroom after the loft space is converted. Spaces lower than 0.9m in height do not count as Gross Internal Area. They must be used for storage. Minimum Gross Internal Area: For a single bedroom this must be a minimum of 7.5 square metres, and at least 2.15 metres wide. For a double, 11.5 square metres and a minimum of 2.75 metres wide. No one likes strangers tramping around their home, making lots of noise. Though we do try to work around your requirements while converting your attic space, there will be a lot of disruption for around 4.5 weeks for a rear dormer loft conversion in a terraced property, while in a semi detached property with a gable end and rear dormer, this could take 5.5 weeks. This obviously depends on your specifications and fittings, as well as any issues that we discover to do with the building’s structure. For most attic conversions there is no need for planning permission, though you will need to get Building Regulations Consent from your local council to ensure that the attic conversion meets modern standards. If the volume is over 40 cubic metres in a terraced house, or 50 in a detached or semi detached house. There is no extension beyond the existing slope of the roof fronting the road. A rear Dormer will not need permission but a front one will. No roof extension is permitted in certain ‘designated areas’. These include national parks, World Heritage Sites, conservation areas and Areas of Outstanding Natural Beauty. Building regulation consent must however be given. You need to submit your final plans to the local council for approval. If you pay an architect to do this, they should meet the regulations as part of their design. What are my chances of getting planning permission? As long as the extension fits into the general look of an area, and is not too flamboyant then you should not expect problems from the council planners. It always helps to pay a planning consultant to help you get through the process. Though they can cost a lot of money, they can save you the pain of going through the process multiple times with their expertise in going through the planning process. It is cheaper to do it in one go than to go back to the architect several times, paying them each time! A Velux window is a window that fits in with the existing plane of the roof. They are cheaper to put in but do not add to the space inside. A Dormer is a head height extension with the window sitting vertically as the windows in your wall. Though this will cost more to put in, it adds to the Gross Internal Area and could add even more value to your home. They also bring more light into the space. What about the chimney and water tank? If the chimney passes through the middle of the loft, then it must be either demolished or moved to one end of the space. You also need to consider where your water tank will go. You could for instance put this in the storage space under the eaves. Many people may consider doing away with their gravity fed hot water and central heating systems and installing a new pressurised hot water system as this dispenses with the need for a water tank in the loft space. The ceiling beneath the floor of your attic conversion must be able to hold off a fire for a minimum of 30 minutes under current building regulations. In addition you must have a suitable escape route from the new space. With a loft conversion taking the property to being a three storey house, it will will require a protected stairwell that connects to a hall and final exit at ground floor level or give access to at least two escape routes to final exits at ground level that will be separated by fire resisting construction and fire doors. The new top storey can instead be separated by fire resisting construction and provided with an alternative escape route (subject to planning permission), or a domestic sprinkler system can be designed by a fire engineer.